With side trips to The Battle of South Mountain, Harpers Ferry and Second Manassas! Our trip exceeded my highest expectations. We had a great group of people and the creme de la creme of tour guides. A familiarity with the topography of a battlefield is essential to comprehend how and why a battle unfolded the way it did. No pictures, maps or written descriptions can take the place of an actual visit to the field itself. Our trip vividly brought this point home to me. I am ready to go again! Just a short note tonight. the sharpsburg tour was entertaining, very informative, and just a good, fun trip. We covered all of the main sites to follow the course of the battles . Randal supplied us with great info, directions, and people! to bring this history to life. Certainly the friendliest, most relaxed, and best conducted tour that I have seen. 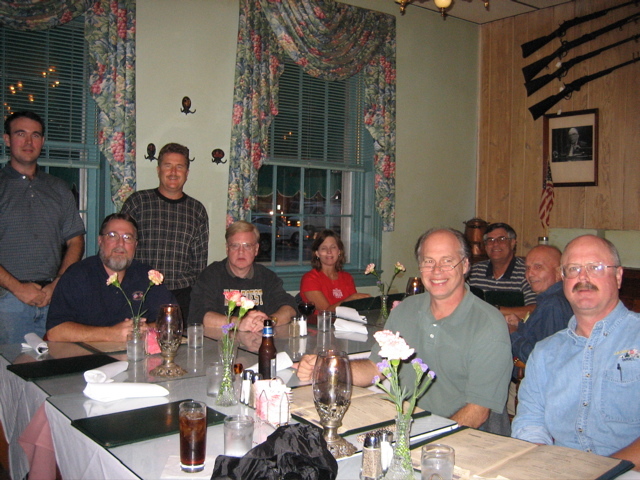 Let's do it again with a small group -good happy folks and for sure we want Randal again. What Great Knowledge of the civil war and many other things! Thanks again, Mike for a fine job organizing . we all appreciate it. Our big trip in 2005 was Sharpsburg (Antietam) We decided on the weekend of Oct. 21-23. Our tour guide was Randal Garrison. 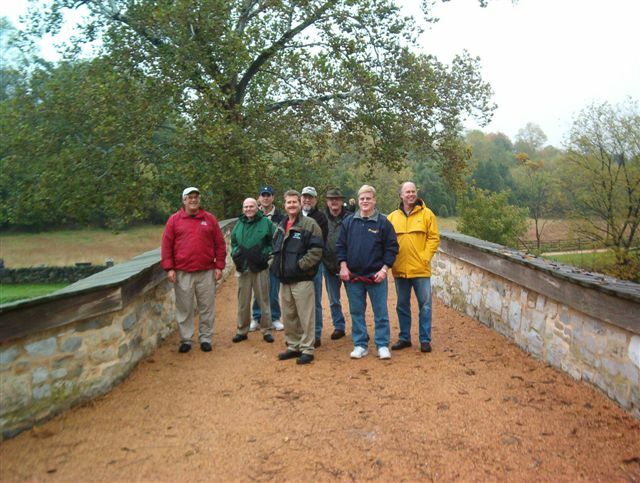 Tours also led on a regular basis to Fredricksburg/Chancellorsville/Wilderness/Spotsylvania/First and Second Manassas/Shiloh/Vicksburg/Fort Donelson/Franklin/Chickamauga and others. Saturday morning we went to three locations that helped explain the Battle of South Mountain. Here we are at Fox's Gap. 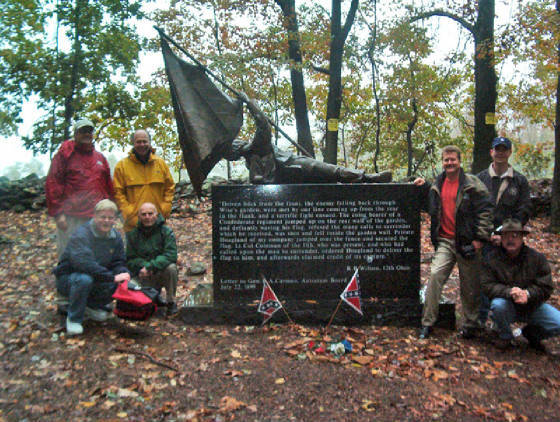 This monument to North Carolina Troops is down a long path in the woods. If you did not know where to go it would be hard to find. On this location there was a large hand to hand fight. The monument has a NC Flagbearer that gave his last full measure of life for his Flag and Country. It is a very lifelike and emotionaly moving statue. Here we are at the edge of "The Cornfield". 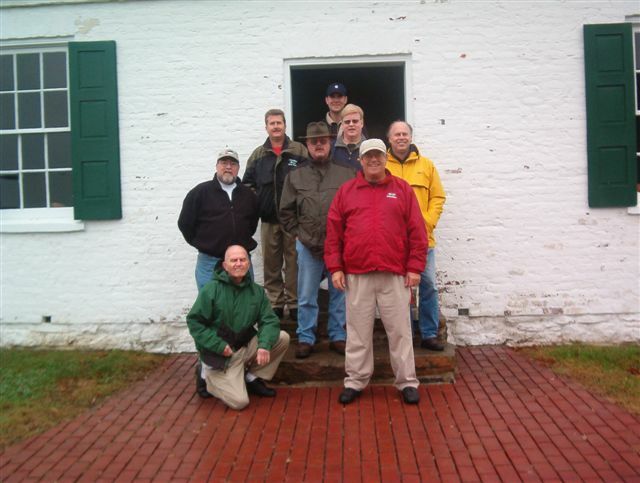 Left to right Standing David Neal, Mike Ross, Randal Garrison, John Sledge, Andy Watson and Jason Harell. Front row Jim Archbell and Roy Archbell. 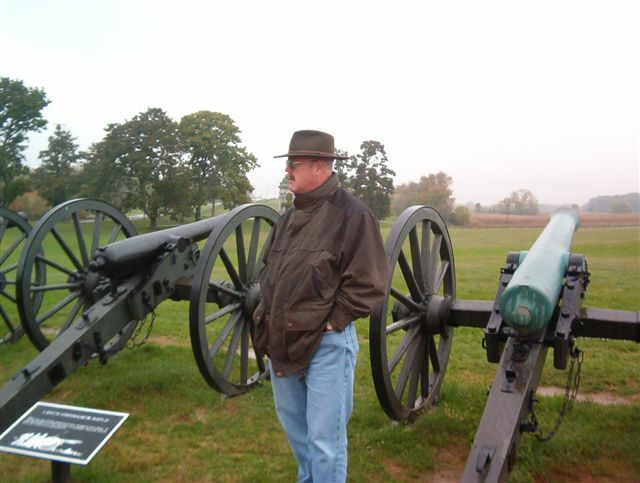 Jim Archbell standing among cannon on "Artillery Hell Hill". Here we are at the door of the Dunker Church. 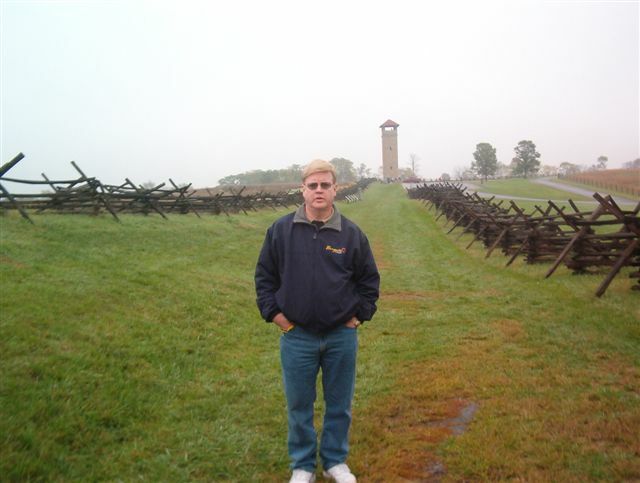 Roy Archbell standing in the "Bloody Lane" at the spot where some of his ancestors stood serving with the Fourth NC. On Sepember 17 of 1862 this lane would have been piled high with Confederate dead and wounded from where they held off repeated Federal attacks. Finally falling back when flanked on the right and the left. Here we are on "Burnside Bridge". 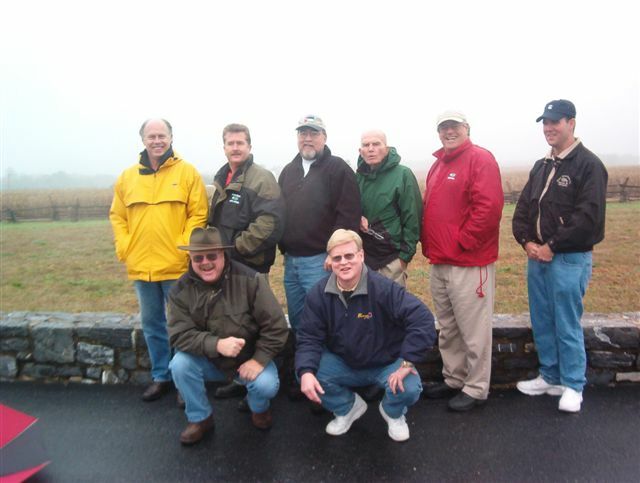 Left to right Andy Watson, Dr. Sledge, Jason Harrell, Mike Ross, Randal Garrison, Jim Archbell, Roy Archbell and David Neal. Battle of Second Manassas in the "Unfinished Railroad Cut". Where Confederates held off repeated Federal attacks so long that they ran out of ammunition. They continued to fight off the attacks by throwing rocks at the charging Federals. They held at great cost. Dinner at Johnson's Charcoal Steak House. What a wonderful time we all had! Thank you Randal Garrison for a fantastic time! 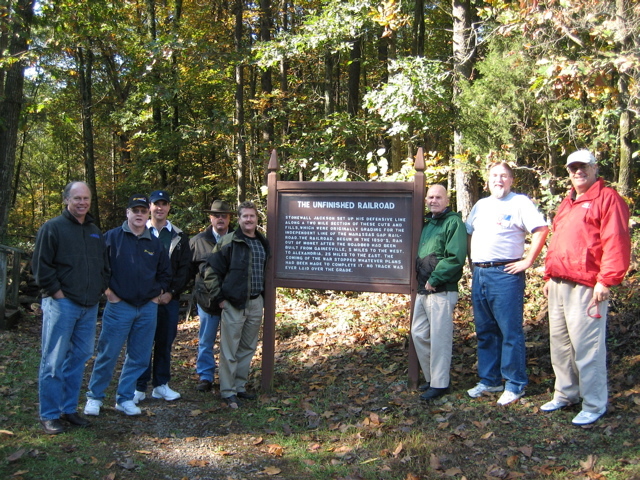 Left to right is Jason Harrell, Randal Garrison, Mike Ross, Roy Archbell, Charlie Archbell, David Neal, Andy Watson, Dr. Sledge and Jim Archbell.